We were at Diwali, or the Festival of Lights. This holiday is celebrated by Hindus, Sikhs, and Buddhists around the world, and we weren't sure what we were getting ourselves into. “Basically, it's like the Hindi combination of Christmas and the Fourth of July—because they give presents and often shoot fireworks,” Kim reckoned. This gig was very different than all our others. Vinay Sood from the Jackson Association of Indians had asked Our Jackson Home to cover the event. Both of us beamed when our editor asked if we would like to be the writers. Day 1: Cleaning, decorating, and shopping; prayers usually offered to Kubar. Day 2: Bathing rituals; women often adorning themselves with henna; cooking a plethora of sweets; prayers offered to Lakshmi, goddess of wealth and prosperity. Day 3: Dressing in new clothes; important relationships recognized; gifts given; fireworks set off; sweets throughly enjoyed. Day 4: Celebrating the relationship between husband and wife (kind of like everyone celebrating their wedding anniversary on the same day). Day 5: Celebrating the lifelong bond of the sister-brother relationships. We were delighted by the many aspects of unity we experienced at the Festival of Lights. 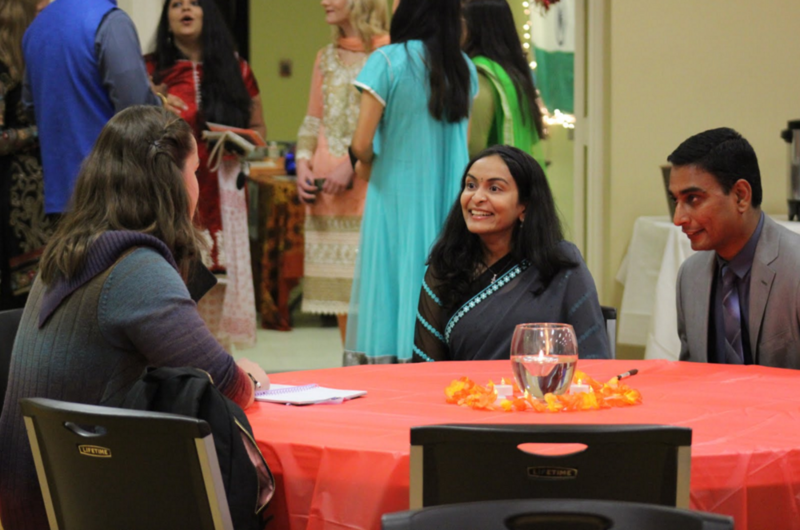 In only a few hours we met Hindus who had traveled in from Dyersburg, Memphis, Jackson, New Jersey, and even various states of India; we met a Sikh, a local pharmacist, who explained the different reasons Sikhs and Hindus celebrate the holiday. We met a Christian couple who has lived in Jackson for over thirty years and had come to the festival in order to “express solidarity,” because this is their community. We re-met many people who had made the International Food and Art Festival possible and even reconnected with a family Melissa had served at Olive Garden the week before, who had attended at the invitation of their Indian neighbors. Perhaps the most astonishing thing to us was that all this was going on less than two miles from our houses! We were excited to witness the multi-generational and intercultural bonds being displayed between neighbors we didn’t even know we had. The evening officially began with a time of prayer. Individuals gathered around an Indie prayer altar while children of varying ages led the group in a chant selected especially for Diwali. Not being able to understand Hindi (regrettably), all we could understand was that name of the goddess of wealth, Lakshmi, was repeated often. As best as we could gather from our place at the edge of the crowd, the prayer was accompanied by lighting candles and burning incense. 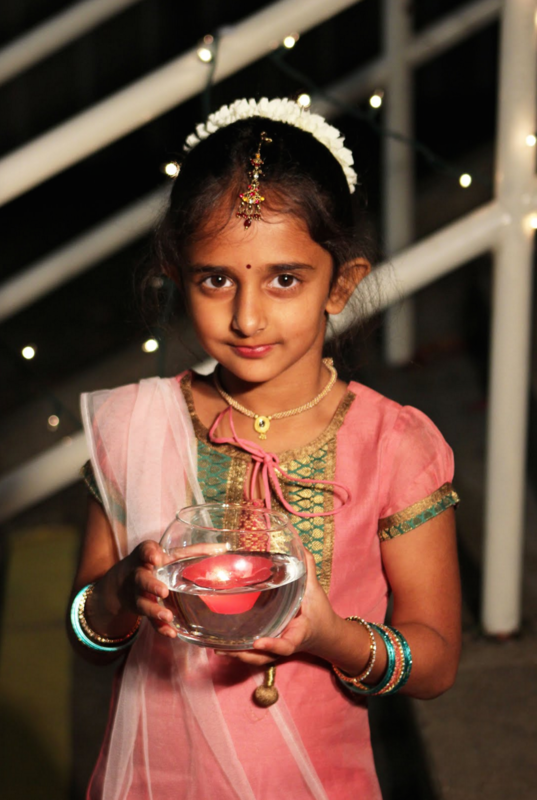 This year’s Diwali festival had fallen on Children’s Day, which meant that basically every part of the ceremony involved the children (which meant that every part of the ceremony was wonderful). The night began with the children leading us in both the Indian and American national anthems. This was followed by the exciting announcement of the West Tennessee Health Center’s sponsorship of the event and the recognition of those who had labored to make the evening so beautiful. After the Mayor spoke, a woman assumed the stage. She prayed, “May god protect us, let us be content together. Let there be peace, peace, peace.” Then we took a moment of silence for the victims of the Paris attack. Both of us were touched by this kind gesture. Appetizers followed and (in between bites of delicious, traditional dishes) we mingled with the crowd. Meanwhile children graced the stage with dances and songs, and, when they weren’t delighting the crowd, we found time to talk with a few of them. 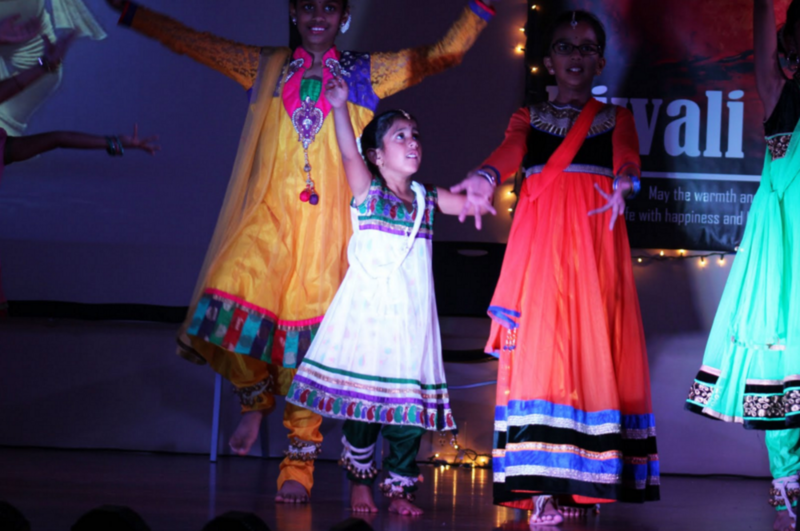 One beautiful eight-year-old girl named Suri told us how she enjoyed dancing with her friends. Her mother explained that the girls had all been taking dance lessons for several months in preparation for this evening. She was hopeful that her daughter would come away with a better understanding of her heritage because of events like this one. As the night progressed, some of the children performed a skit, outlining the festive intricacies of an Indian wedding. Music filled the building as the friends of the bride and the friends of the groom faced each other. It’s a unique Indian tradition that during the wedding feast the bride’s party tries to steal the shoes of the groom while the the groom’s party attempts the same feat. Of course, this is all done in jest. Preetima, a woman from Jaipur, India, who had flown into Jackson for a real wedding, told us that the bridesmaids would smoothly jest with the bride, telling her that they could not return the shoes unless they received gifts. Of course, the bride has planned to do this all along, making the whole ordeal a fun game of gift-giving. After the children’s presentation, several teenage girls in traditional dress with tiki candles in their palms assumed the stage. The girls proceeded to do a cultural dance involving twisting their hands in a way that made the candles zoom through the air in a synchronized motion. As the final note ceased the room erupted with claps and whistles louder and even more enthusiastic than the wedding skit received. At some point during the evening, we noticed “Professional DJ” listed on the bulletin for 9:30 to 11:30. We were not totally sure what all this portion of the event entailed, but waited with eager expectation until the time came. The lights in the large room dimmed considerably and colored lights lit up the stage at the front of the room. With a mixture of American and Indian party music playing, we joined the dance circle already forming and danced enthusiastically alongside people of varying ages, nationalities, ethnicities, and religions. We were honored to be a part of such a unifying event. A special thanks to Vinay Sood and the Jackson Association of Indians for making such an event possible. Photography by Sol Bee Park.